All your life you dreamed of having a recreational vehicle. Maybe you use it to drive cross country and visit your grandchildren, or maybe you're taking your children to see parts of the country that you visited as child. Regardless of how you use your RV it's likely that you need a place to keep it when you're not using it to make memories. Vines Storage makes your decision about where to park your RV easy. 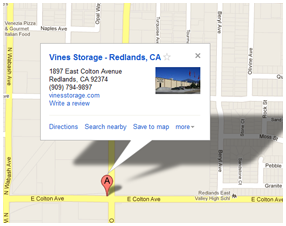 We offer the only indoor storage facility in the Redlands, CA, area where you can park your RV yourself. Indoor storage keeps your investment securely protected from sun damage that can hurt the tires, awnings, and paint. Additionally, you can be extra sure that your RV is safe from theft or damage. In our spacious warehouse facility, we can accommodate even the largest of recreational vehicles. Additionally, we offer our RV owners great amenities such as an on-site ice maker, a commercial air compressor, sewage waste dump sites, a place to charge batteries, and purified water. These amenities are enjoyed by customers of Vines Storage. Vines Storage offers you security and peace of mind. Whether you choose indoor or outdoor storage for your RV, know that your vehicle will be held in a facility that is monitored 24 hours a day, 7 days a week, the gate is open from 7AM until 8PM, and no one gets in without passing through a monitored gate. You can come and go as often as you need to perform maintenance on your RV, or to clean it up prior to upcoming trips. We work with our customers to determine the right leasing package for you. Whether you need to park your recreational vehicle for several weeks, several months, or indefinitely we have options for you so you don't need to take up space in your driveway or on your neighborhood street. Ensure that your RV remains an investment for your family and provides you with the experiences you've dreamed of for years to come. Vines Storage is a storage facility you can trust for reliable, safe, and secure RV storage. Call us today for more information.